To me, layer cakes are for celebrations and this Coconut Cake is a real crowd pleaser. I love everything about it. From its' snowy white marshmallowy frosting that is enveloped in shreds of dried coconut, to the layers of moist and sweet butter cake sandwiched together with a tangy lemon curd. What is nice about this Coconut Cake is that you don't have to make everything on the day the cake is needed. For example, you can make the lemon curd several days (or up to a week) in advance. In fact, it is best if it's made at least a day ahead of time so the flavors have time to soften and mingle. Also, the cake layers can be made the day before, or you can even make and freeze the cake up to two weeks ahead of time. 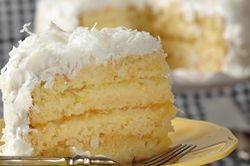 Now, while the coconut flavor in this dessert comes from the dried coconut sprinkled on the cake, you can add more coconut flavor by brushing the baked cake layers with some coconut milk. You can use either sweetened or unsweetened dried coconut and it can be either shredded or flaked. Lastly, we are covering the cake with a Seven Minute Frosting; that fluffy and satiny, meringue-type frosting that tastes like marshmallows. It is made by beating egg whites, sugar, corn syrup, cream of tartar, and water over a saucepan of simmering water until the frosting is thick with a fluffy consistency that holds soft peaks. Amazingly, this takes about seven minutes (hence its' name) although it may take longer if made on a humid day. Once it has cooled to room temperature it should be spread on the cake immediately and while the inside of the frosting will remain soft, you may notice that the outside tends to develop a thin crust as it air dries. You may also notice that after sitting the frosting does tend to become granular and that is why it is best to make and serve this cake the day it is made. Note: You can make an excellent substitute for commerical buttermilk. Stir 1 tablespoon lemon juice or vinegar into 1 cup (240 ml) milk. Let stand at room temperature for about 10 minutes and it's ready to use. Lemon Curd: In a stainless steel bowl, placed over a saucepan of simmering water, whisk together the eggs, sugar, and lemon juice. Cook, stirring constantly (to prevent it from curdling), until the mixture becomes thick (like sour cream or yogurt) (160 degrees F or 71 degrees C). (This can take about 10 minutes depending on the temperature of your simmering water.). Remove from heat and, if needed, immediately pour through a fine strainer to remove any lumps. Stir or whisk the butter and lemon zest into the lemon curd. The lemon curd will continue to thicken as it cools. Cover immediately (so a skin doesn't form) and refrigerate until cold. The lemon curd can be made several days (up to a week) in advance. Preheat oven to 350 degrees F (180 degrees C). Butter and flour two - 9 inch x 2 inch (23 x 5 cm) cake pans, and then line the bottoms of the pans with parchment paper. Buttermilk Cake: In a mixing bowl sift or whisk together the flour, baking powder, baking soda, and salt. In bowl of electric mixer, or with a hand mixer, beat the butter until soft (about 1-2 minutes). Gradually add the sugar and beat until light and fluffy (about 3 minutes). Add the eggs, one at a time, beating well after each addition. Scrape down the sides of the bowl. Add the vanilla extract and beat until combined. With the mixer on low speed, alternately add the flour mixture (in three additions) and buttermilk (in two additions), beginning and ending with the flour. Evenly divide the batter and pour into the prepared pans, smoothing the surface with an offset spatula or the back of a spoon. Bake for about 27 to 30 minutes or until a toothpick inserted into the center of the cake comes out just clean and the cake springs back when lightly pressed in the center. Frosting: Put the egg whites, sugar, water, corn syrup, and cream of tartar in a stainless steel bowl. With a handheld electric mixer beat the mixture until the ingredients are well combined. Then place the bowl over a saucepan of simmering water. Continue to beat, on medium-low speed, for about 3 minutes. Then increase the speed to high and continue to beat for another 3 to 4 minutes or until the frosting forms soft peaks. Remove from heat, add the vanilla extract, and continue to beat on high speed for another 1 to 2 minutes or until the frosting is thick and of spreading consistency. Let cool to room temperature and then use immediately. Assemble: With a serrated knife, cut each cake layer in half, horizontally. Place one cake layer on your serving plate and spread with about 1/3 of the lemon curd and sprinkle with about 2 tablespoons of coconut. Continue with the next layers, stacking and filling with the lemon curd and coconut. Frost the top and sides of the cake with the 7-Minute Frosting and then sprinkle with dried coconut. If not serving immeditely, cover and refrigerate the cake.